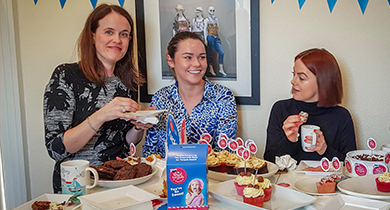 The Temple Street Foundation raises money which enables the Temple Street Children’s University Hospital to provide world class care and to pioneer new treatments and cures for childhood illnesses. With over 145,000 patient visits every year, they need support to help them give hope to young patients and their families. 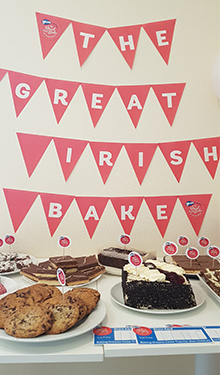 KMCS hosted a Great Irish Bake at their head offices on Thursday 4th April to raise funds for this world class hospital. Staff rallied round on Wednesday deciding what would be baked, ingredients needed and general banter about favourite puddings! Black forest Gateau was discussed as one of the main puds of the 80’s and a search began as to where it could be purchased. 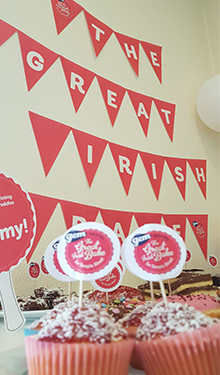 Edel Farrelly found an amazing cake at Thunders Café in Ranelagh. On the morning of the event it was no surprise to see the generosity of all as they arrived and set up their cakes, buns, tray bakes and cookies. What a selection of amazing creations! 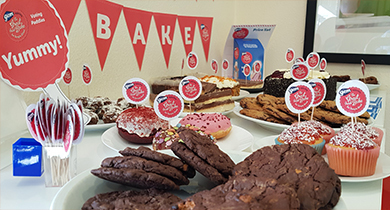 The one thing that made this event stand out is the commitment of all KMCS staff to bake and donate, we had a full house and certainly full bellies! One creation that stood out and in fact is a regular request at KMCS is Alan McHale’s Moro Squares. 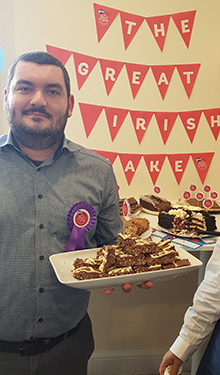 Alan was awarded the Temple Street’s Great Irish Bake Rosette for his achievement. Also, a special thanks to Adrian Fennell and Lesley Mangan for their diligence in getting the event organised, it couldn’t be done without you. Every single day, hundreds of sick children and their worried families come through the doors of Temple Street in need of world-class medical care. Temple Street raise the funds needed to ensure that these children have access to the very best paediatric equipment, facilities and supports when they need it most. KMCS are delighted to be part of this fundraising and we urge you to support this wonderful facility.